Fossil fragment of maybe a cephalopod, perhaps a Dawsonoceras that has been squished. 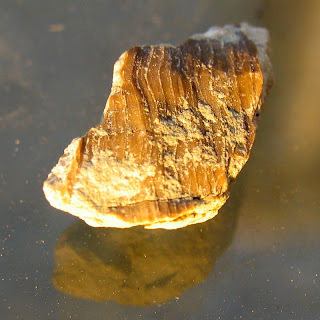 Fragment found in Waldron Shale of Clark County, Indiana. Dated to the Middle Silurian Period. Below is a primitive graphic I created to try and understand the stratigraphy of the Louisville, Kentucky area. It is based off information I read on the Indiana Geological Survey website and Ancient Animals book by Steinrock, Conkin & Conkin. 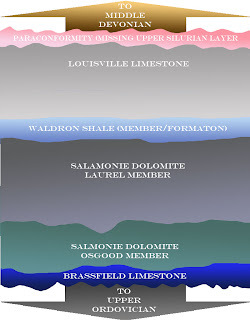 The image needs more information (timeline) and layer graphics still.